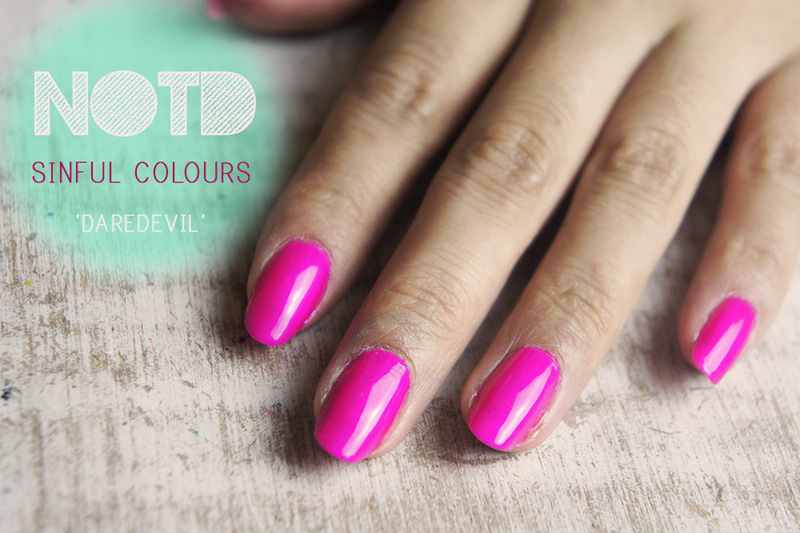 So this gorgeous shade of neon pink is called DAREDEVIL and it is by a company called Sinful Colours. I absolutely love wearing this on my nails right now. It’s such a good pick me up shade! I’m calling it my “Happy Polish” because it cheers me up when I have it on, and lately I have been a rather depressive mope. The colour reminds me a little bit of a pink, highlighter pen, it’s super bright and luminous. I think it is a really flattering shade though, especially for warmer/tan skin tones, which makes it perfect for summer fingers and toes! The formula for a polish that costs as little as £1.99 is phenomenal! It goes on ultra smooth and the brush makes it super easy to apply in one smooth stroke. The polish does dry into a really cool finish which is neither glossy nor matte. It’s really hard to describe, but it looks a bit velvety. I have used a high shine Top Coat in my photos though, because I find the gloss brings out the purple undertones better and gives it that three dimensional finish and shine! This is definitely one of my fave products to wear lately and I’m looking forward to trying out some of the other shades in the range. I got my eye on “SOUL MATE” and “APPLE’ which I might pick up my next trip to Boots. If you fancy taking a peak at their range you can find them in Boots, or online HERE. Anyone else tried these polishes? Tags: Daredevil, Nail Polish review, Nails, Reveiw, Sinful Colours, Swatch. Bookmark the permalink. Cute post and good photos as ever… let me use your camera then! Stop hogging it. and teach me how to use those lights! Sometime I wear my sister’s nail polish but we have different tastes so she doesn’t wear mine! I wish you could feel the huge I’m sending you. I know it’s a hard moment but I hope better days will come. That’s such a gorgeous colour! And I’m so jealous of how long your nails are! Good day. I am wondering if you would be interested in doing a website link exchange? I notice your blog: and my website are based around the same topic. I’d love to swap links or perhaps guest author a write-up for you. Here is my personal e-mail:. Be sure to contact me if you’re even slightly interested. Many thanks.